2012 VP113 was first observed in November 2012 and announced earlier today. 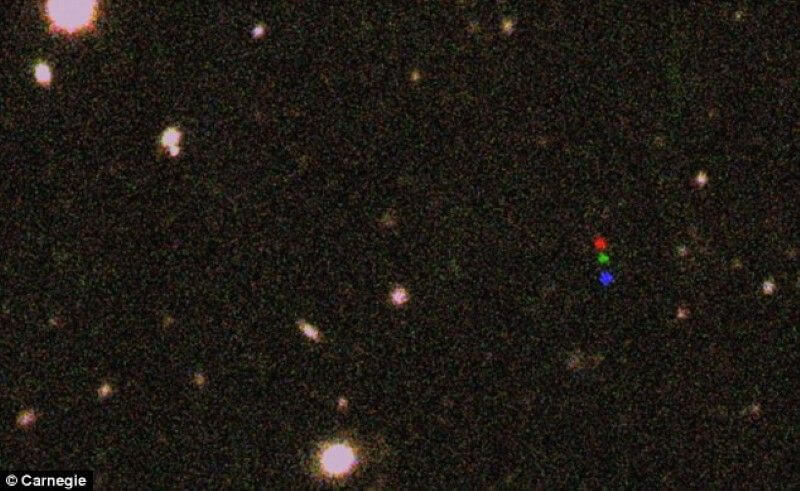 It is the most distant dwarf planet to be found orbiting our sun. It is approximately 280 miles wide (450km) and orbits beyond the comet-rich Kuiper Belt in a region at the very edge of the system called the Oort cloud. 2012 VP113 is around half the diameter of dwarf planet Sedna, discovered a decade ago, and lies 80 times further from the sun than the Earth. The similarity in the orbits for Sedna and 2012 VP113 points to an as yet undiscovered ‘Super Earth’. The two dwarf planets are among of thousands of objects believed to form the inner Oort cloud and were found to have a similar orbit, suggesting the presence of a planet up to 10 times the size of Earth. The observable solar system is divided into three distinct regions including the rocky terrestrial planets such as Earth, the gas giants like Saturn and Jupiter, and the icy Kuiper Belt objects – beyond which lies the Oort cloud. There are three theories for how the inner Oort cloud could have formed. One is a rogue planet could have been tossed out of the giant planet region and perturbed objects out of the Kuiper Belt on its way. This could have been ejected or still be in the distant solar system today. The second claims a close stellar encounter could put objects into the inner Oort cloud region, while the third theory suggests inner Oort cloud objects are extra-solar planets captured by other stars that were near our sun in its birth cluster. The total population of the inner Oort cloud is likely bigger than that of the Kuiper Belt and main asteroid belt. These images show the discovery of the new inner Oort cloud object 2012 VP113 taken about 2 hours apart on 5 November 2012. Highlighted by the arrow. The motion of 2012 VP113 stands out compared to the steady state background stars and galaxies. The researchers used a Dark Energy Camera (DECam) in the Chilean Andes to discover 2012 VP113. They then used the nearby Magellan telescope to determine its orbit and obtain detailed information about its surface. ‘Some of these inner Oort cloud objects could rival the size of Mars or even Earth,’ said Dr Sheppard.From the sky, researchers were able to use DECam to calculate about 900 objects with orbits similar to Sedna and 2012 VP113. ‘This is because many of the inner Oort cloud objects are so distant even very large ones would be too faint to detect with current technology,’ continued Dr Sheppard. Both Sedna and 2012 VP113 were found near their closest approach to the Sun but they both have orbits at which point they would be too faint to spot.